A few months ago I subscribed to an initiative of a few organic farmers in my area. All kinds of farmers, produce, cattle and dairy, joined forces and created a website where customers (in a certain area) can order their foods. They deliver it at your house every friday for a measly three euros (about four dollars). So, every week I look what they have to offer and order what I want: all organic/grass fed and local. Brilliant! This week they had these rainbow carrots on sale and I thought they were too pretty not to buy. So I ordered them and then had to figure out what to do with them. Because they are so pretty, I thought it would be a waste to chop them up and dump them in a dish where you could hardly recognise them. So I came up with a recipe that was very easy, only a few ingredients, and would bring out the beauty and flavor of these babies. 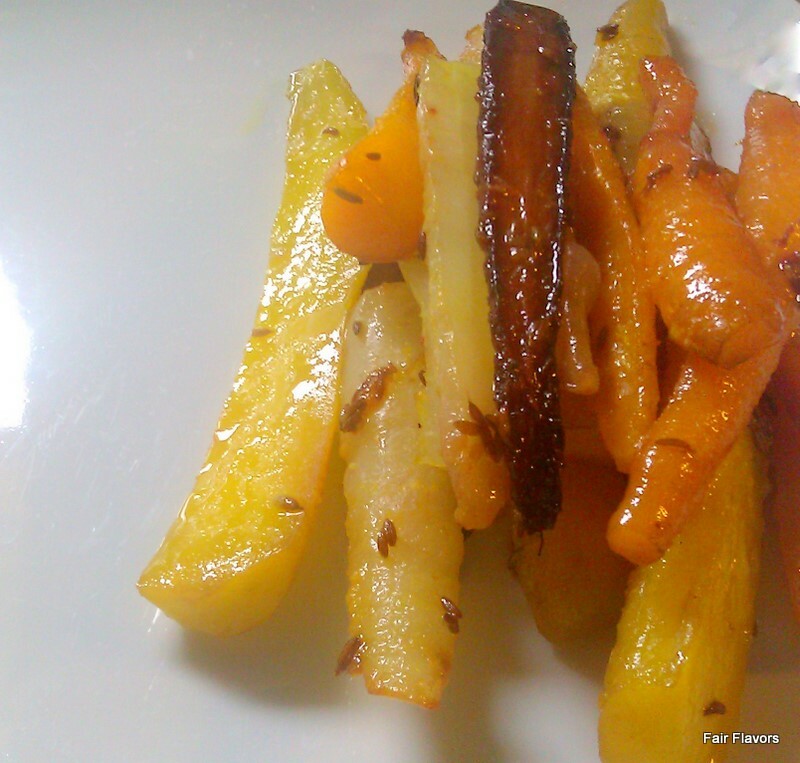 Orange and cumin go very well with carrots, and roasting them brings out the best of their flavor. You can serve it hot or cold. It's lovely either way. 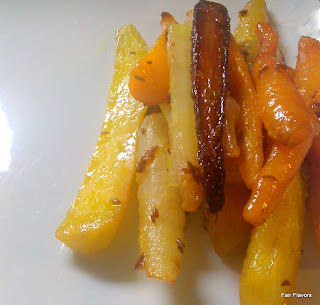 And of course you don't need rainbow carrots for this recipe, it works just as well with regular orange ones. Preheat oven to 440F (225C). 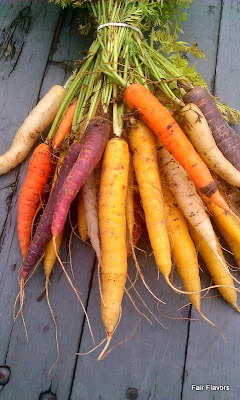 Cut both ends of the carrots, wash and peel or scrape them. Put the carrots in an oven proof baking dish. Melt 1 tbsp of butter in a small sauce pan. Add the melted butter to the carrots and toss, covering all the carrots with some butter. Cover the dish with alu foil and place in the hot oven for 30 minutes. When they're almost done, melt another tbsp of butter in the sauce pan.When the butter is really hot, add the cumin seeds. Let them sizzle for half a minute and add the grated ginger. Stir for half a minute more and turn the heat off. Add the orange juice and sweetener and stir, until all is mixed well. Note: I love ginger with orange and carrots, so I added it to the recipe. Some people can't stand the taste of ginger and I know from experience that this recipe is also lovely without it. It's the combination of the orange and cumin that really does the trick. The ginger gives it an extra kick. Sounds devine will definitely try!